Fish oil, containing mainly long-chain n-3 polyunsaturated fatty acids (LCn-3PUFA), has been found to acutely stimulate protein synthesis and insulin-mediated glucose metabolism. However, the underlying mechanism and more prolonged effect of fish oil during ageing remain to be determined. Fish oil (EPAX6000; 49.6 % eicosapentaenoic acid, 50.4 % docosahexaenoic acid) or control oil (60 % olive, 40 % soy) supplementation was delivered, via chocolate-derived sweets, to rats for 8 weeks. Throughout the study, food intake and body weight were recorded and body composition was investigated using EchoMRI. During the last 40 min of a 6 h infusion, with labelled dextrose ([U-13C]glucose) and amino acids ([1-13C]phenylalanine), blood samples were collected to assess glucose and phenylalanine kinetics. Soleus and longissimus dorsi muscles were extracted for protein and mRNA analyses. Fish oil had no effect on food intake or body composition. 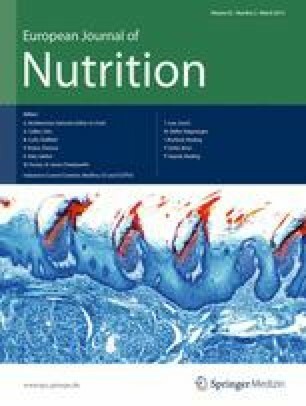 An increased whole-body glucose turnover, mainly accounted for via an increase in endogenous glucose production, was observed with fish oil feeding. No effects on whole-body phenylalanine turnover were observed. In longissimus dorsi, fish oil augmented the phosphorylation of phosphoinositide 3-kinase (PI3K)[Tyr458] (P = 0.04) and 70 kDa ribosomal protein S6 kinase (p70s6k)[Thr389] (P = 0.04). There were no differences in protein kinase B (Akt)[Ser473], mammalian target of rapamycin (mTOR)[Ser2448], protein phosphatase 2A (PP2A) 56 kDa regulatory B subunit γ (PP2A-B56-γ), forkhead box containing proteins O-subclass 3a (FOX03a)[Ser253] or inflammatory markers (Interleukin-6, Interleukin-1 β, tumour necrosis factor-α, and cyclooxygenase-2). Our data suggest that the fish oil may stimulate endogenous glucose production and increase anabolic signalling in ageing rats. Stuart R. Gray and M. Carole Thivierge contributed equally to this work. The authors would like to thank Patricia Crombie, Denise Tosh, Alun Hughes and Cecile Itzstein for technical assistance. Special thanks are extended to A. Graham Calder and Susan Anderson for their great assistance in the GC–MS analyses. Acknowledgements are also extended to Grietje Holtrop for her assistance in performing the deconvolution matrix approach to the glucose isotopomer isotopic enrichment data. The study was funded by the Scottish Executive Environment and Rural Affairs Department. T. K. has been supported by the grant from Ministry of Science and Technology and Khon Kaen University, Thailand.